Rowland, Laura Joh. (2012). The Incense Game. Minotaur Books; New York. Sometimes it’s nice to delve into a book packed with historical details and rife with emotional intrigue. 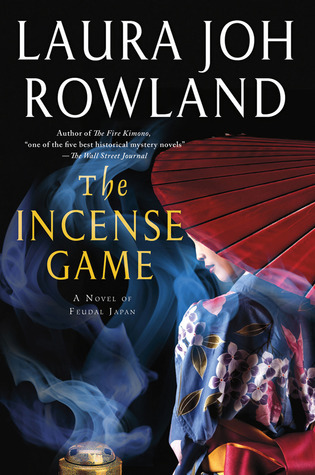 Laura Joh Rowland‘s book The Incense Game nicely delivers on both fronts; it details what happens before, during, and after a powerful earthquake that struck a vast area of Japan on December 31st, 1703, and is the 16th mystery with her star protagonist, Sano Ichiro (Macmillan, 2013). Image rights to Minotaur Books 2012. Laura’s writing on Japan’s earthquake is particularly poignant because she lived through the disaster wrought on New Orleans by Hurricane Katrina in 2005 (Macmillan, 2013). In fact, The Incense Game is dedicated to “those who lost their lives” and her “fellow survivors of natural disasters” (Rowland, 2012). I found myself caught in the web of political intrigue and lies played out in this rich historical novel. Many of the characters are also based on real-life historical characters, including the shogun, his friend Yanagisawa Yoshiyasu, his nephew Ienobu, his mother Lady Keisho-in, and Lord Hosokawa (Rowland, 2012). I was fascinated by the descriptions of kōdō (香道, “Way of Incense”), or the Japanese art of appreciating incense, which are at the heart of Sano’s murder investigation (Wikipedia, 2013). Of all of Laura’s books, which includes a series of historical novels based on Charlotte Bronte, The Incense Game is the recipient of the RT Reviewers’ Choice Award for Best Historical Mystery Novel (Rowland, 2013). This award is a testament to the excellent writing, plot, and character development found in this intriguing and captivating novel.